I have recently started cycling to work; and found it to be quicker than I have to allow to get the bus as I had to get two buses. I am using the same bike I used to use in early 90s in Cambridge. It was originally my dad’s. I used another bike in late nighties since which was stolen which was also given me by my dad. And my dad gave me this one back last year, but it took me till now to take plunge to cycle to work. The route I take is mostly off the road on disused railway path and then on path along the Water of Leith. 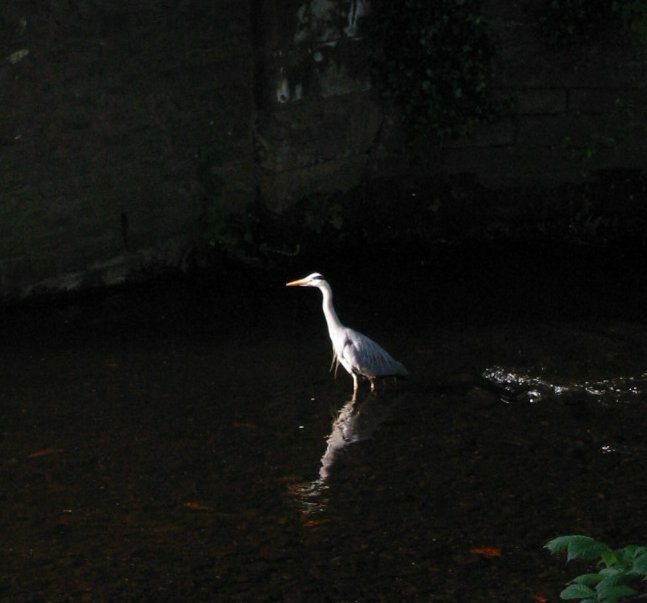 Yesterday I saw a sawn building it’s nest, as well as heron which looked very elegant, just standing around in same spot water for quite a while. I had seen it before near weir next to my workplace. I am looking forward to getting fitter and more trim with cycling. I will also save a bit of money but I will have to still get bus on a few days and a day ticket in Edinburgh is now £2.50 , whereas 4 weekly bus pass I used to use is £37; so saving are not as great as first might be though with ditching bus pass but still having to use bus on some days. But once I have decided to ditch the bus pass I can use £2.50 saving as motivation to cycle. The other week I stayed with my parents in Leeds and we went to my Grandparents diamond wedding anniversary celebration in Sheffield. It was good to see so many relatives. One thing I do every time I stay with my Parents is see how the oak tree planned in Garden in 1999 is doing. It came from a collection of Oak saplings that Marina Findley had grown from acorn collected from Pressmennan woods. But they had become pot bound, dried out and most had died. This one was on of few that barely survived. It was either 2 or 3 years old. When it was first planted in Leeds it lost all leaves straight away but it recovered the next year and after a year or two put on a big spurt. It is now doing very well. I think about how it it look in hundreds of years. Ulla enjoys her allotment, but I don’t get out to it much myself and don’t really wish to spend long period there. I hope we get a place with a home with it’s own garden sometime, which can grow trees as well in.